Our Club is situated two miles from the centre of the town and the seafront. Offering a spacious reception area and changing rooms, we offer 6 rinks with a visitor seating area and a large car park alongside a fully licensed bar and catering facilities. We have a membership in excess of 400 including social members. We also actively encourage disabled people in the community to come along and take up this amiable and friendly sport, and we have all the necessary equipment for the disabled. Like most indoor bowls clubs Langney is open to its members all year round, this is to accommodate our members who no longer wish to play the game outdoors. We now have a very healthy summer membership and have been able to put together a comprehensive programme of matches throughout the summer months. 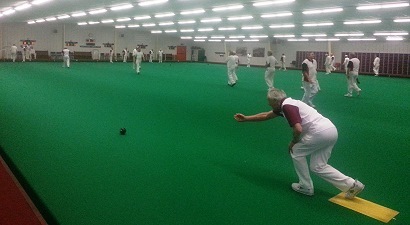 Langney Indoor Bowls Club is a progressive club and has been very successful in attraction new members. Our "Bowls for free scheme" gives potential new members four free 2 hour lessons. advantage of this unique offer, why not pop in and have a chat to our friendly team of green stewards who can give futher information on the coaching on offer.